And it was true. 16-year-old Christina Heichelbech lost her life, the victim of an EF-3 tornado that destroyed much of the small town of Clay, Alabama, a suburb of Birmingham – and also my home. 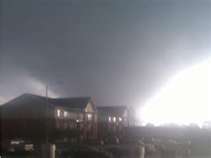 On Monday, January 23, 2012, at 3:58 am, the deadly EF-3, as wide as 8 football fields laid end to end, packing winds of 150 mph, cut through our community. 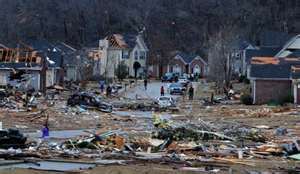 It destroyed or damaged nearly 300 homes, injured over 100 people, and left the landscape looking like a war zone. Roofs ripped from homes, houses reduced to splintered piles of rubble, cars buried under trees and debris, and trees twisted out of the ground with their root balls still intact, tossed across roads and power lines. Gas lines were ruptured, power lines were downed, roads and streets were impassable, strewn with the detritus of life and home and family. Families wandered in the pre-dawn darkness, barefoot and pajama clad, dazed, looking like zombies. Lost and shocked, unable to comprehend the utter destruction, the ruins in the rain. We went to sleep on a normal Sunday night, and awoke on Monday to a world that was changed forever. And that is when the magic started. Before dawn, they began to arrive. Firemen, policemen, members of the armed forces, neighbors and family members and friends. And they kept coming. Strangers from across town, from other cities, from other states. It began with a trickle that became a full-fledged flood of helping hands and listening ears and strong backs. They came with chainsaws and blankets. They came with sandwiches and fresh-baked cookies. They came with coffee and water and soft drinks. They came with kind hearts and teary eyes. They came with grills and supplies and fresh clothes and diapers. They came. Webster’s defines hero as “a person admired for his achievements and noble qualities or one who shows great courage”. In Greek mythology, a hero was a demigod. They figured heavily in the ancient Greek religion. In time, the concept of a hero was someone who faced danger and difficulty, but pressed on to help others in need. That is a great description of those who showed up in Clay Alabama in the hours and days following the devastation. They worked tirelessly, cutting trees and moving tons of debris. They delivered food and supplies, and opened their homes to those rendered homeless by the storm. They made sandwiches and iced tea and drew colorful inspirational pictures on lunch bags. They gave to others from their own pantry, their own closet, their own wallet. Their jobs done, many of our heroes have begun to pack their trucks and cars with their tools and supplies, ready for the next call of someone in need. They will be leaving us soon. But Clay, Alabama is a better place because of them. Our streets are cleared, the destruction has been organized into neat piles of wood and metal and plastic and glass that line the roadside everywhere you go. We have places to sleep and clothes to wear. We have food to eat and warm blankets to cover our beds. We have new friends who proved themselves in the crucible of disaster as someone who listened and comforted us when we broke into tears without warning. And as important as all those things are, and as appreciated as they are, our heroes leave an even greater legacy. In their wake, they leave inspiration. They leave a bright spot on a horizon that is otherwise dark and discouraging. Our heroes leave us with a sense of hope. And maybe, of one day, becoming heroes ourselves. This entry was posted on Thursday, February 2nd, 2012 at 2:02 pm	and posted in Uncategorized. You can follow any responses to this entry through the RSS 2.0 feed.